Sensory deprivation or perceptual isolation is the deliberate reduction or removal of stimuli from one or more of the senses. Simple devices such as blindfolds or hoods and earmuffs can cut off sight and hearing, while more complex devices can also cut off the sense of smell, touch, taste, thermoception (heat-sense), and 'gravity'. 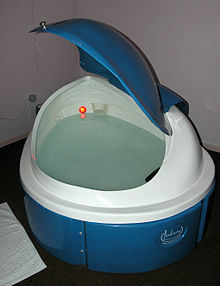 Sensory deprivation has been used in various alternative medicines and in psychological experiments (e.g. with an isolation tank). Short-term sessions of sensory deprivation are described as relaxing and conducive to meditation; however, extended or forced sensory deprivation can result in extreme anxiety, hallucinations, bizarre thoughts, temporary senselessness, and depression. A related phenomenon is perceptual deprivation, also called the Ganzfeld effect. In this case a constant uniform stimulus is used instead of attempting to remove the stimuli; this leads to effects which have similarities to sensory deprivation. Sensory deprivation techniques were developed by some of the armed forces within NATO, as a means of interrogating prisoners within international treaty obligations. The European Court of Human Rights ruled that the use of the five techniques by British security forces in Northern Ireland amounted to a practice of inhumane and degrading treatment. There are two basic methods of restricted environmental stimulation therapy (REST): chamber REST and flotation REST. In chamber REST, the subject lies on a bed in a completely dark and sound-reducing (on average, 80 dB) room for up to 24 hours. Their movement is restricted by the experimental instructions, but not by any mechanical restraints. Food, drink, and toilet facilities are provided in the room and are at the discretion of the tester, who can communicate with the participants using an open intercom. Subjects are allowed to leave the room before the 24 hours are complete; however, fewer than 10% actually do because they find the chamber so relaxing. Chamber REST affects psychological functioning (thinking, perception, memory, motivation, and mood) and psychophysiological processes. In flotation REST, the room contains a tank or pool. The flotation medium consists of a skin-temperature solution of water and Epsom salts at a specific gravity that allows for the patient to float supine without worry of safety. In fact, to turn over while in the solution requires "major deliberate effort." Fewer than 5% of the subjects tested leave before the session duration ends, which is usually around an hour for flotation REST. For the first 40 minutes, it is reportedly possible to experience itching in various parts of the body (a phenomenon also reported to be common during the early stages of meditation). The last 20 minutes often end with a transition from beta or alpha brain waves to theta, which typically occur briefly before sleep and again at waking. In a float tank, the theta state can last for several minutes without the subject losing consciousness. Some use the extended theta state as a tool for enhanced creativity and problem solving. Spas sometimes provide commercial float tanks for use in relaxation. Flotation therapy has been academically studied in the US and in Sweden with published results showing reductions of both pain and stress. The relaxed state also involves lowered blood pressure, lowered levels of cortisol, and maximal blood flow. Apart from physiological effects, REST seems to have positive effects on well-being and performance. Several differences exist between flotation and chamber REST. For example, with the presence of a medium in flotation REST, the subject has reduced tactile stimulation while experiencing weightlessness. The addition of Epsom salts to attain the desired specific gravity may have a therapeutic effect on hypertonic muscles. Since one of the main results of chamber REST is a state of relaxation, the effects of chamber REST on arousal are less clear-cut, which can be attributed to the nature of the solution. Also, due to the inherent immobilization that is experienced in flotation REST (by not being able to roll over), which can become uncomfortable after several hours, the subject is unable to experience the session durations of chamber REST. This may not allow the subject to experience the changes in attitudes and thinking that are associated with chamber REST. Additionally, the research questions asked between each technique are different. Chamber REST questions stemmed from research that began in the 1950s and explored a variety of questions about the need for stimulation, nature of arousal and its relationship with external stimulation. Practitioners in this area have explored its utility in the treatment of major psychiatric dysfunctions such as substance abuse. On the contrary, flotation REST was seen as more of a recreational tool as it was tested more for its use with stress-related disorders, pain reduction and insomnia. Numerous studies have debated which method is a more effective treatment process, however, only one has explored this statistically. Nineteen subjects, all of whom used chamber or flotation REST to induce relaxation or treat smoking, obesity, alcohol intake or chronic pain were analyzed. The statistic of interest, d, is a measure of the size of the treatment effect. For reference, d=0.5 is considered a moderate effect and d=0.8 a large effect. The 19 subjects who underwent chamber REST had d=0.53 and six flotation REST subjects showed d=0.33. Additionally, when examining subjects undergoing REST treatment and REST in conjunction with another treatment method, there was little difference. However, Flotation REST has the advantage of a lower duration required (45 minutes as opposed to 24 hours). The use of REST has been explored in aiding in the cessation of smoking. In studies ranging between 12 months and five years, 25% of REST patients achieved long-term abstinence. REST, when combined with other effective smoking cessation methods (for example: behavior modification) resulted in long-term abstinence of 50%. Also, when combined with weekly support groups, REST resulted in 80% of patients achieving long-term abstinence. Comparatively, the use of a nicotine patch alone has a success rate of 5%. Alcoholism has also been the target of research associated with REST. In conjunction with anti-alcohol educational messages, patients who underwent two hours of REST treatment reduced alcohol consumption by 56% in the first two weeks after treatment. The reduction in consumption was maintained during follow-ups conducted three and six months after the first treatment. It is, however, possible that this is caused by the placebo effect. In addition, REST has been tested to determine its effect on users of other drugs. A University of Arizona study used chamber REST as a complement to traditional outpatient substance abuse treatment and found that four years later, 43% of the patients were still sober and drug-free. Eight months later, no one in the control group remained clean. Schizophrenics appear to tend to experience fewer hallucinations while in REST as compared to non-psychotic individuals. A possible explanation for this could be that non-psychotic individuals are normally exposed to a greater degree of sensory stimulation in everyday life, and in REST, the brain attempts to re-create a similar level of stimulation, producing the hallucinatory events. According to a 2009 study published in the Journal of Nervous and Mental Disease, the hallucinations are caused by the brain misidentifying the source of what it is currently experiencing, a phenomenon called faulty source monitoring. A study conducted on individuals who underwent REST while under the effects of Phencyclidine (PCP) showed a lower incidence of hallucination in comparison to participants who did not take PCP. The effects of PCP also appeared to be reduced while undergoing REST. The effects PCP has on reducing occurrences of hallucinatory events provides a potential insight into the mechanisms behind these events. The five techniques of wall-standing; hooding; subjection to noise; deprivation of sleep; deprivation of food and drink were used by the security forces in Northern Ireland in the early 1970s. After the Parker Report of 1972, these techniques were formally abandoned by the United Kingdom as aids to the interrogation of paramilitary suspects. The Irish government on behalf of the men who had been subject to the five methods took a case to the European Commission of Human Rights (Ireland v. United Kingdom, 1976 Y.B. Eur. Conv. on Hum. Rts. 512, 748, 788-94 (European Commission of Human Rights)). The Commission stated that it "considered the combined use of the five methods to amount to torture." This consideration was overturned on appeal, when in 1978 the European Court of Human Rights (ECtHR) examined the United Nations' definition of torture. The court subsequently ruled that the five techniques "did not occasion suffering of the particular intensity and cruelty implied by the word torture," however they did amount "to a practice of inhuman and degrading treatment," which is a breach of the European Convention on Human Rights, Article 3. (e) deprivation of food and drink: subjecting the detainees to a reduced diet during their stay at the center and pending interrogations. José Padilla, a United States citizen from Brooklyn, New York, was convicted in federal court of aiding terrorists in 2007 and was sentenced to 17 years and 4 months in prison. While awaiting trial, reports surfaced that, to persuade him to reveal information, he was subjected to sensory deprivation for weeks at a time. For 1,307 days, Padilla was kept in a 9' x 7' cell with no natural light, clock or calendar. When Padilla left his cell, he was shackled and fitted with heavy goggles and headphones. His counsel argues that while he was being interrogated Padilla was subjected to harsh lights and pounding sounds. While meeting with his counsel, they reported Padilla exhibiting facial tics, random eye movements and unusual contortions of his body. According to them, Padilla had become so "shattered" that he became convinced his lawyers were part of a continuing interrogation program and saw his captors as protectors. In January 2008, the BBC aired a Horizon special entitled "Total Isolation". The premise of the show centered on six individuals, four men and two women, agreeing to be shut in a cell inside a nuclear bunker, alone and in complete darkness for 48 hours. Prior to isolation, the volunteers underwent tests of visual memory, information processing, verbal fluency and suggestibility. After the two days and two nights, the subjects noted that their inability to sense time, as well as hallucinations, made the experience difficult. Of the six volunteers, three experienced auditory and visual hallucinations—snakes, oysters, tiny cars and zebras. One was convinced their sheets were wet. Two seemed to cope well. When complete, the tests that the subjects took before the experiment were conducted a second time to test its effects. The results indicated all volunteers' ability to complete the simplest tasks had deteriorated. One subject's memory capacity fell 36% and all the subjects had trouble thinking of words beginning with a nominated letter; in this case, the letter "F". All four of the men had markedly increased suggestibility, although this was not the case with the women. "It's really hard to stimulate your brain with no light. It's blanking me. I can feel my brain just not wanting to do anything." — Adam Bloom (volunteer subject) — "Total Isolation"
^ Sireteanu, R; Oertel, V; Mohr, H; Linden, D; Singer, W (2008). "Graphical illustration and functional neuroimaging of visual hallucinations during prolonged blindfolding: A comparison to visual imagery". Perception. 37 (12): 1805–1821. doi:10.1068/p6034. ^ Stuart Grassian Psychiatric effects of solitary confinement(PDF) This article is a redacted, non-institution- and non-inmate-specific version of a declaration submitted in September 1993 in Madrid v. Gomez, 889F.Supp.1146. ^ Wackermann, J; Pütz P; Allefeld C (Jun 2008). "Ganzfeld-induced hallucinatory experience, its phenomenology and cerebral electrophysiology". Cortex. 44 (10): 1364–78. doi:10.1016/j.cortex.2007.05.003. PMID 18621366. ^ a b c Suedfeld, Peter (1999). "Health and therapeutic applications of chamber and flotation restricted environmental stimulation therapy (REST)". The International Journal of the Addictions. 14: 861–888. ^ Kjellgren, A; Sundequist, U; et al. "Effects of flotation-REST on muscle tension pain". Pain Research and Management. 6 (4): 181–9. ^ Ballard, Eric (1986). "Flow of consciousness in restricted environmental stimulation". Imagination, Cognition and Personality. 5: 219–230. ^ Wallbaum, Andrew; Rzewnicki, R; Steele, H; Suedfeld, P (1991). "Progressive muscle relaxation and Restricted Environmental Stimulation Therapy for chronic tension headache: A pilot study". International Journal of Psychosomatics. 38 (1–4): 33–39. PMID 1778683. ^ Suedfeld, Peter; Coren, Stanley (1989). "Perceptual isolation, sensory deprivation, and REST: Moving introductory psychology texts out of 1950s". Canadian Psychology. 30 (1): 17–29. doi:10.1037/h0079795. .
^ Baker-Brown, G; Baker-Brown, G (1987). "Restricted environmental stimulation therapy of smoking: A parametric study". Addictive Behaviors. 12 (3): 263–267. doi:10.1016/0306-4603(87)90037-2. PMID 3310529. ^ Coren, Susan; Coren, Stanley (1989). "Perceptual isolation, sensory deprivation, and REST: Moving introductory psychology texts out of 1950s". Canadian Psychology. 30 (1): 17–29. doi:10.1037/h0079795. ^ Marvin Zuckerman & Nathan Cohen (1964). Sources of Reports of Visual Auditory Sensations in perceptual-isolation experiments. ^ a b Mason, O; Brady, F (2009). "The psychotomimetic effects of short-term sensory deprivation". Journal of Nervous and Mental Disease. 197 (10): 783–785. doi:10.1097/NMD.0b013e3181b9760b. PMID 19829208. ^ Total Isolation (TV-series). United Kingdom: BBC. 2008. Zubek, J. (ed.) (1969). Sensory deprivation: Fifteen years of research. Appleton Century Crofts. Dirk van Dierendonck & Jan Te Nijenhuis - Flotation restricted environmental stimulation therapy (REST) as a stress - management tool: A meta-analysis. Marvin Zuckerman & Nathan Cohen (1964). Sources of Reports of Visual Auditory Sensations in perceptual-isolation experiments. P.R Corlett, C.D Frith, P.C.Fletcher (2009). From drugs to deprivation: a Bayesian framework for understanding models of psychosis. Goldberger, L. Experimental isolation: An overview. Amer. J. Psychiat., 1966, 122, 774-782. Heron, W. The pathology of boredom. Sci. Amer, 1957, 196, 52-56. Suedfeld, P. (1980). Restricted environmental stimulation: Research and clinical applications. Wiley Interscience. Zuckerman, M., et al. Experimental and subject factors determining responses to perceptual and social isolation. J. abnorm. Psychol. 1968, 73, 183-194. Zubek, J. (Ed.) 1969, Sensory deprivation: Fifteen years of research. Appleton Century Crofts. By the Numbers Findings of the Detainee Abuse and Accountability Project Report of the Detainee Abuse and Accountability Project (26 April 2006).